Õpet is an intelligent AI companion chatbot designed to help secondary students with their exam revision. Covering the entire GCSE and “A” Level (and their equivalent in various jurisdictions) urriculum, Õpet is an effective, affordable and convenient digital private tutor to help students revise effectively for their exams. Õpet seeks to deliver sophisticated conversations to help expand students’ horizons. Through continuous engagement, Õpet will record accurately and securely on a blockchain all information relevant and useful to college admission processes – like users’ interests, preferences, academic progress, records of extra-curricular activities, testimonies, and even personality profiling using the University of Cambridge’s Unique Personality Profiling Tool. Education is a global evergreen industry. Worldwide expenditures rose to an estimated $6 trillion in 2016, with spending on higher learning forecasted to rise eight percent this year to $2.05 trillion. Year-on-year growth in demand is fueled globally by population growth and an expanding middle class in Asia and Africa. According to a report published by Citigroup in July 2017, the total K-12 global market is estimated to be $3 trillion, with a post-secondary market estimated to be $1.5 trillion. Blockchain technology has enabled global high school students to record their academic and extra-curricular records safely in a distributed ledger. This system creates an ecosystem of tamper-proof and accurate student information that is made available to schools, universities and other validation agencies worldwide. Furthermore, it creates a total disintermediation and disaggregation of higher education placement and admission processes, where validation and micro-accreditation can take place easily and conveniently. Schools and teachers are under constant pressure to improve the academic performance of students, all of which possess greatly varying levels of ability – in individual subjects and across the board. As students reach the higher grades, it becomes increasingly difficult for schools to meet the individual demands of students when their spectrum of academic and extracurricular needs is taken into account. This problem is amplified by traditional pedagogical methods found in most classrooms, most of which significantly limit the scope for tailoring lessons and learning material to students’ individual learning needs. This is where Õpet will fit in. Our platform introduces progressive education which combines distributed ledger, AI, machine learning and chatbot technology with personalized learning. The individually-tailored educational supplement is powered by Õpet’s unique artificial intelligence recommendation engine, and is manifested as a companion chatbot serving as a digital companion to complement students’ national and local curriculum revision programs. Õpet is essentially an educational chatbot which is digitally available to students at any time. Its primary function is to serve as a personal learning companion which provides a customized learning experience to every student. Our target audience will be primarily GCSE O-level (Grade 9-10) and A Level (Grade 11-12) students that will benefit from a personalized learning aid powered by artificial intelligence and machine learning. As each student has an individual learning curve, we foresee AI and machine learning will be of great assistance to students, offering a customized and personalized approach to individual curriculum support. Our goal is not just to become a global education platform that supports our chatbot. We’re building a trusted learning companion which will serve as a medium for collecting social and personality profiles, learning patterns, academic and extra-curricular activity history prior to undergraduate/tertiary studies. The application for this informational database will span across many countries, offering utility to schools, universities, educational institutions and other validation agencies and authorities around the world. 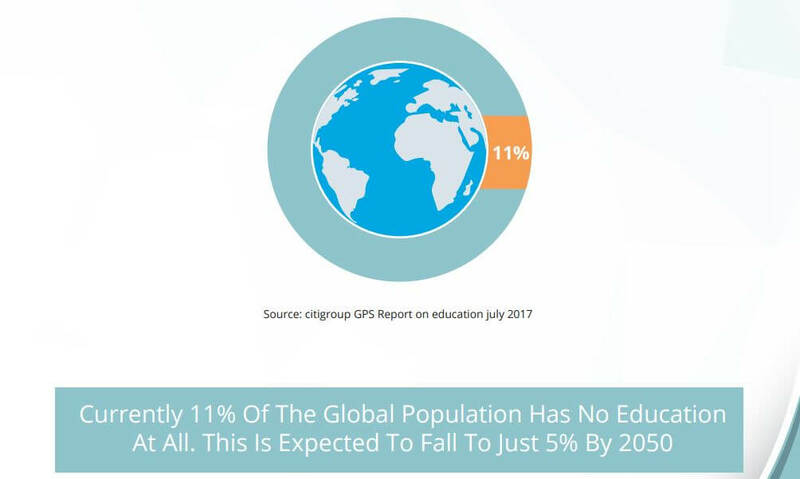 According to Citigroup’s Education: Back to Basics report, the global education market is approximately US$5 trillion dollars, with K-12 segment being the largest at near US$3 trillion dollars. The post-secondary segment is valued at US$1.5 trillion dollars. 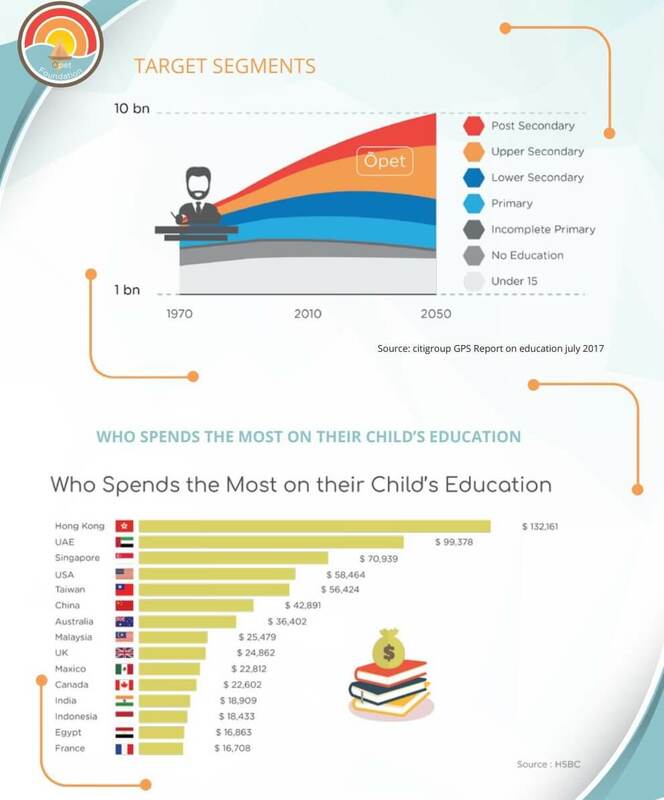 With only 2% of this US$5 trillion global education market currently being digital, it is foreseeable that the digital trend will play a key role in increasing productivity in the future. In most countries, basic education is seen as a right where governments are duty bound to provide education, while individuals are often required by law to attend education up to a certain age or level, typically the Secondary level. 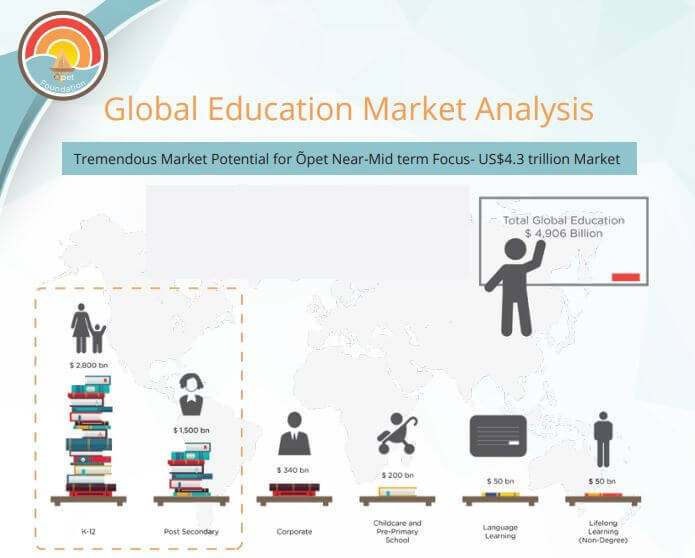 Furthermore, the favorable demographics of large emerging markets in India, Southeast Asia, South America and Africa, will see great market potential for Õpet’s target segment of Upper Secondary students. When countries such as India, China and Malaysia are considered, the growth rate of the market is exceptional, at roughly 50% per year. While the UK’s GCSE and A Level curriculum is only our first bowling pin market, we will expand to different jurisdictions to allow our algorithms to learn their respective National curriculum. 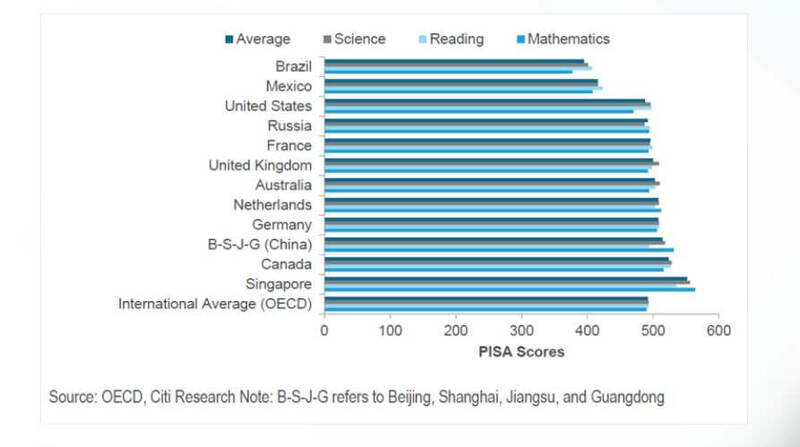 This provides a good opportunity for Õpet, with its Singaporean pedigree to introduce its unique “brand” of educational revision style to the world, substantiated by Singapore’s relatively strong and consistent performance on the Program for International Student Assessment (PISA) Scores. Presently, the 2015 digital or e-learning market was worth only around $165 billion, approximately 3% of the total global education market. Since then, however, the industry has grown considerably and is likely to reach $250 billion by 20239. Self-paced e-learning is even more nascent. According to a Docebo report10, global revenues for self-paced e-learning reached $46.6 billion in 2016, which translates to only ~30% of the entire e-learning market. All these indicate a large potential for digital-based educational products to contribute to achieving our global vision of enabling access to opportunities through education via technology. Development of Curriculum Database; Data-transformation and processing of data-fields. Development of Backend Artifacial intelligence and Chatbot Engine. Integration of all relevant technological APls. Development of the Beta version of our Õpet App. Development of Blockchain as ONE true source of high-school records for students globally. Beta Testing with Selected international Schools. Õpet Wallet Setup. Major Marketing Campaign for Õpet app roll-out-Learning Companion Digital Serives using ÕpetCoin/Fiat. Establish Exchange Listings. Android and iOS Version Release of Õpet app on GooglePlay & iTunes. Influencer identification and Marketing in UK . Referral System to grow userbase and awareness in other geographies.